This Central Minnesota club gathers twice monthly for business meetings and club socialization. The club conducts quarterly auctions. The club participates in the APS circuit book system. Guests are welcome to visit the club at our meetings, held at the Whitney Senior Center in Saint Cloud, Minnesota. 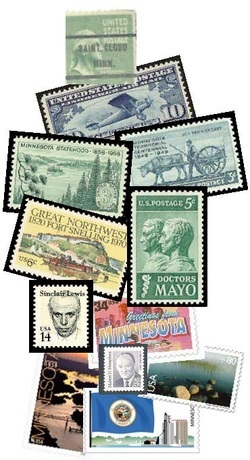 The Mid Minnesota Coin Expo includes an informational booth staffed by the Saint Cloud Area Stamp Club. Hopefully some stamp dealers will be present. Kelly Inn ballroom, 100 4th Avenue South, Saint Cloud, MN 56301. Map.